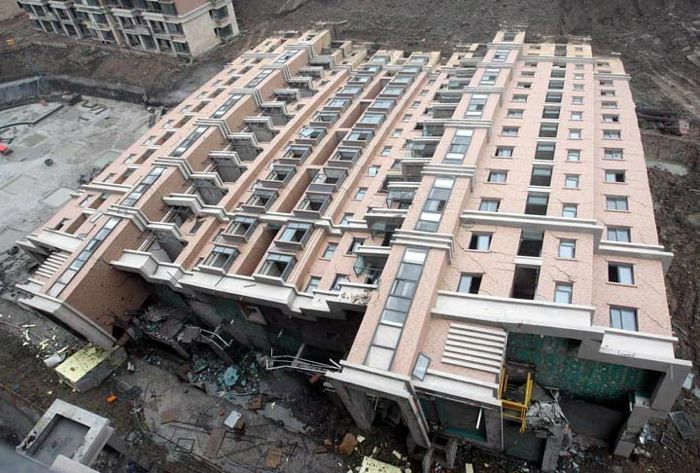 A few months back (around July 2009) this block of apartments in the Minxing district of Shanghai toppled and fell on its side. It was one of many brand new buildings as yet unoccupied, now something of a tourist attraction as authorities figure out just what to do with it. 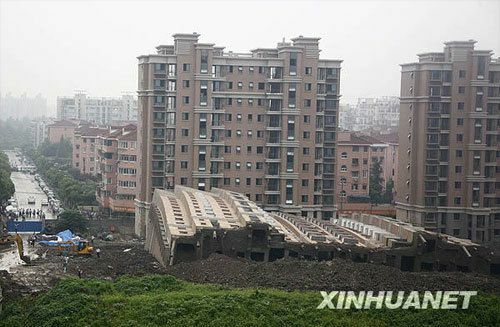 One construction worker was killed in the collapse, which is awful but quite lucky compared to the numbers that would have died had the thing been occupied by the 300-odd residents who had already bought apartments within it, and were waiting to move in. Still fairly pristine, just on its side. 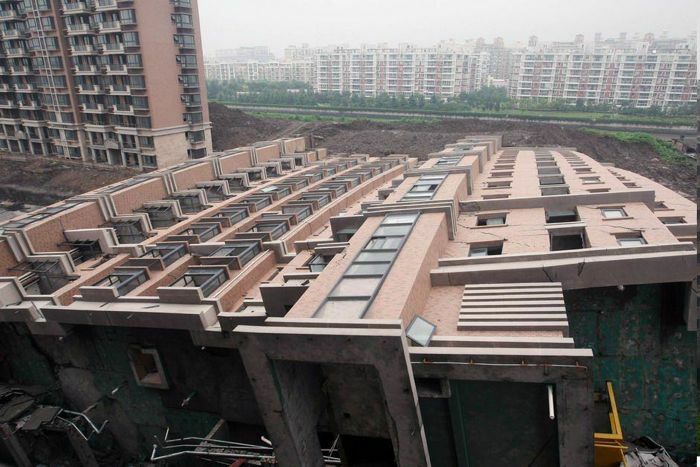 It was one apartment block in a series of blocks in the Lotus Waterside development. Had it perhaps fallen a different way, or been one of the other blocks, it might have started a domino effect and taken all the other buildings with it. Fortunately it did not. Narrow escape of a domino effect. I read variously on the web that it was caused due to poor foundations and problems caused by rising water levels in the nearby river. 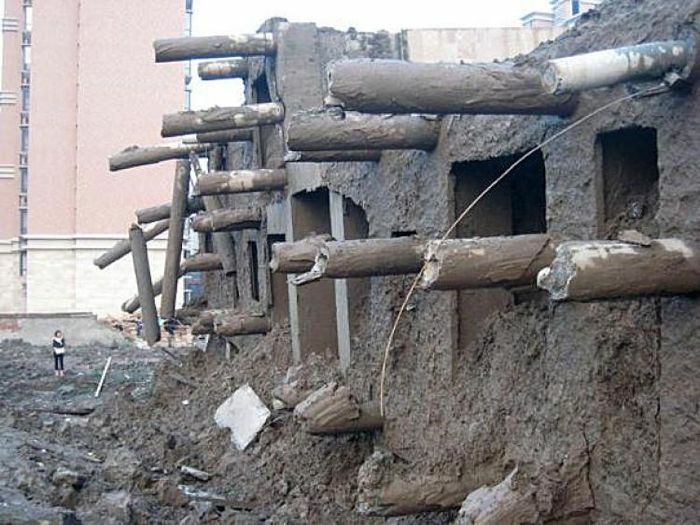 Take a look at these pilings in its foundation- of course these may have gone much deeper and snapped off- but they don’t look too impressive. Tourists come to take a look. With the river in sight that was probably its downfall. I suppose most of the haikyo you feature on this site are monuments to human folly in one way or another, but this one is especially galling as they were playing with people’s lives. 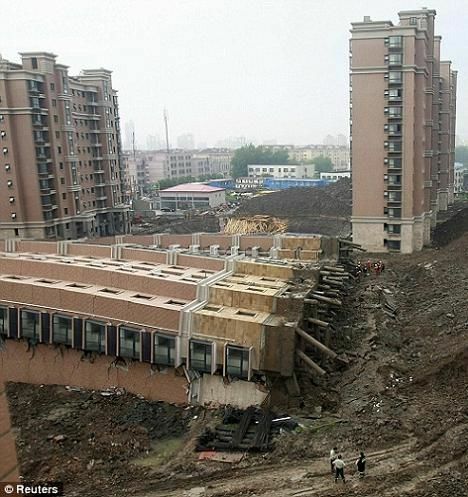 As you note, it’s very lucky timing that this disaster cost so few human lives, but it reminds me of the May 2008 earthquake in Chongqing and the children buried alive under collapsed sub-standard school buildings. May God have mercy on us. Who’s going to want to live in the other buildings now? Right on David, very lucky timing here, but as Tornadoes adds- who’s going to want to live there now? I can’t imagine. I certainly wouldn’t. Zoran- You and me both. 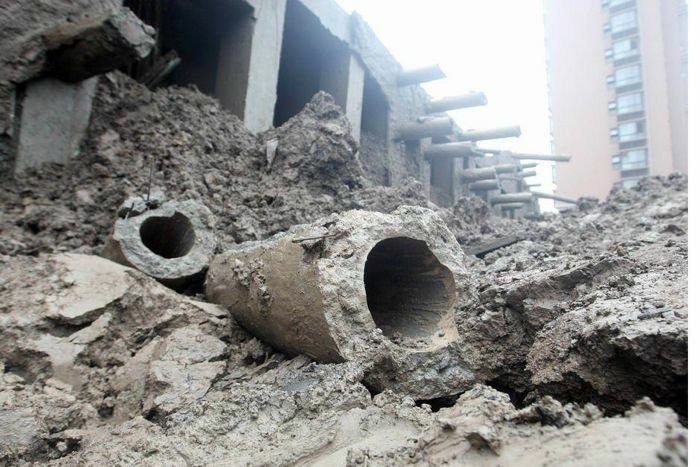 According to the Chinese Press, the fall was caused by a late change to the design — a garage was being excavated on the south side of the building; the excavated material was piled on the north side. 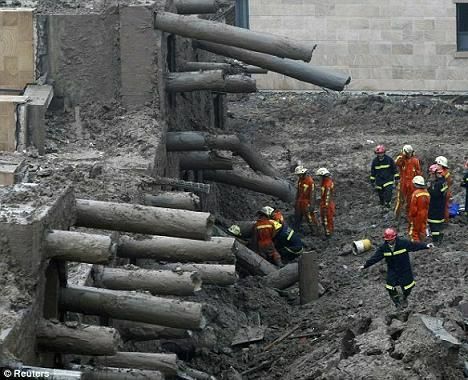 When it rained the extra lateral pressure (maybe 3000 tonnes) was over the design load of the pilings, which snapped. Thanks for the extra info Peter. I wonder what will become of the development..